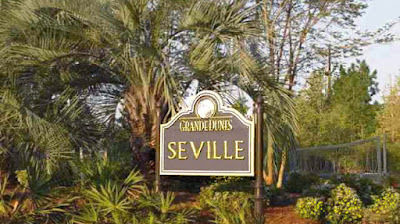 The Grande Dunes Community is one of the most prestigious groups of neighborhoods in Myrtle Beach. It stands as a symbol of elegance and luxury to which all other communities aspire. Encompassing around 2200 acres of the best golf course, waterfront, and beach front property, new developments are being added all the time. There are fewer than 100 homes in the Seville subdivision. Nestled around lakes, protected wetlands, and the Intracoastal Waterway, these elegant Mediterranean-style homes offer all the luxury upgrades you can imagine, with prices running from $500,000 to $900,000. Lots are available for about $150,000 for those who wish to custom build. One of the best full-service marina with 126 boat slips and 1200 linear feet of boat docks capable of accommodating yachts as large as 120 feet or more. Grande Dunes Tennis Center with 10 lighted Har-Tru courts, pro shop, private lessons with certified pros, tennis camps, tournaments, match play, locker rooms, fitness center, members lounge, pool, and more. Grande Dunes Courses – 2 18-hole award winning courses, The Members Club and Resort Club offer memberships that provide elegant clubhouses, lounges, pro shops, private locker rooms, golf lessons, tournament play and much more. Call our real estate professionals for a tour of the homes for sale in Seville in Grande Dunes today.